Yet Schultz remains characteristically undaunted. “I am certainly prepared for the cynics and the naysayers to come out and say this cannot be done,” he told the New York Times. “I don’t agree with them. I think it’s un-American to say it can’t be done. I’m not doing this to be a spoiler.” Such dogged self-regard has driven the businessman’s dalliances with social justice causes over the years, as well, perhaps most memorably with his widely-panned “Race Together” initiative from 2015. At the time, Schultz, by all accounts tormented by the killings of black men at the hands of American police that seemed to saturate daily news coverage, sought to encourage conversations about race in his Starbucks stores by having baristas write the term “Race Together” on customers’ drink orders. Critics on social media jumped down his throat, deriding the initiative as superficial, half-baked, and foisting undue emotional labor upon his low-wage employees. “Honest to God, if you start to engage me in a race conversation before I’ve had my morning coffee, it will not end well,” tweeted the late PBS NewsHour anchor Gwen Ifill. 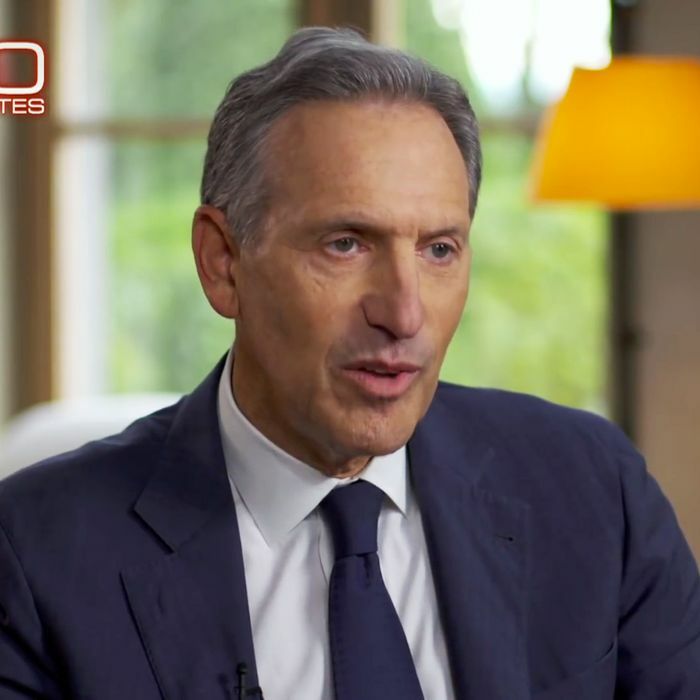 Yet by committing himself with such fanfare to using his corporate platform to address racial inequality, Schultz has inevitably opened himself up to questions about how he might handle the issue were he elected president. There is little evidence to suggest his interest would wane dramatically — he has launched pilot programs aimed at sharing profits from stores in Harlem and South Los Angeles, historically black and Latino areas, with their surrounding neighborhoods; initiated a hiring push to employ more “disconnected and disenfranchised” black and Latino youth; and stated, in a June interview with CNBC, that “racial tensions” in the U.S. remain at crisis levels. But despite admitting that “the burden of proof is on [him] to establish legitimacy” in the racial justice space, Schultz’s commitment to the issue he deems most pressing — America’s national debt — indicates a political philosophy that has traditionally harmed the very communities he says he wants to help. Inveighing against the welfare state and its purported ills is a time-worn strategy for Republicans, and one that poor black Americans recognize as part of an ongoing effort to shame them. The racial dimension of these broadsides — in the form of suggestions, both subtle and overt, that black people in particular take advantage of government largesse to bankroll their lazy lifestyles — was behind Paul Ryan’s claims that a “work ethic” deficiency in “our inner cities” affirms the need for cuts, as well as Ben Carson’s statement that public housing is too comfortable and thus discourages people from getting jobs. Real compassion, Carson told the New York Times in 2017, means refusing to give public housing beneficiaries “a comfortable setting that would make somebody want to say: ‘I’ll just stay here. They will take care of me.’” The political imperative here is unambiguous: Conservatives sell austerity by capitalizing on the reality that white people — who comprise roughly 90 percent of the GOP base — tend to support welfare programs at lower rates when they believe their economic status is threatened by nonwhites. The right does not have a monopoly on such thinking. The tenets of President Clinton’s 1996 Personal Responsibility and Work Opportunity Reconciliation Act — which included new work requirements for welfare recipients and time limits on how long they could receive said benefits for — were predicated on similar assumptions that government assistance was the province of loafers. And despite his well-documented racial equality initiatives, Schultz, who grew up in public housing himself, considers such programs equally disposable. This liberal co-sign for austerity belies the fact that Democratic constituents would be among its greatest victims. People who are financially insecure tend to vote Democrat. Black people, the party’s most loyal racial demographic, receive Medicaid and food stamps at rates greater than their population share, and are dramatically overrepresented in government jobs compared to whites. Whether a future policy agenda would actually reflect Schultz’s austere rhetoric is to be determined — pursuing the kinds of initiatives as president that he did as a private citizen would cost money, after all. But considering how such rhetoric has traditionally been weaponized in electoral politics, the outlook for black America does not look promising.